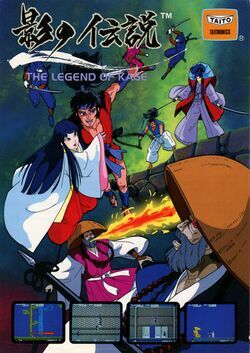 The Legend of Kage is an arcade game developed by Taito Corporation in 1984. In an age when ninja's were usually presented in a cartoon like manner, Taito created a game that was a visual and audio phenomenon, presenting ninjas in a far more realistic manner then ever before. Not only that, the game puts you in the role of a ninja with an infinite supply of throwing stars, and an amazing ability to leap from tree branch to tree branch. The object is for a ninja named Kage (pronounced "KAH-geh") to rescue Princess Kiri from mystical villains. Kage must fight his way through the forest, along the secret passageway, up the fortress wall and through the castle, rescuing her two times (three in the NES version) in order to win the game. Each time she is rescued, the seasons change. The game was ported to several popular home computers in Europe, including the Commodore 64, and in Japan for the Famicom and MSX. The Famicom conversion was released in the United States on the NES. While it was actually a very good conversion, on par with the conversion of Kung Fu, its high degree of difficulty and non-intuitive gameplay have given this port a bad reputation. It actually contains a number of power-ups that were not present in the original game. The NES version was re-released on the Wii Virtual Console in Japan on December 19, 2006, and in the United States on February 19, 2007. The arcade version also appears on the PS2 game, Taito Legends 2. A 3D remake version of the game was released for the PSP on Taito Legends Power-Up. Toward the end of the EDO period, Japan was attacked by a group of mystical villains. The beautiful Princess Kiri was kidnapped. Many Samurai warriors were sent to rescue her. None ever returned. You are a daring young Ninja named Kage. You are also the last hope for Princess Kiri's safety. You will need all your courage and Ninja skills in your attempt to rescue the fair Princess from her evil captors! This page was last edited on 14 March 2012, at 04:04. This page has been accessed 14,341 times.